KUCHING: Mayor of Kuching North City Hall (DBKU) Datuk Abang Abdul Wahab Abang Julai is happy with the success of the Old Kuching Smart Heritage Agenda (OKSHe) programme held at the Kuching Waterfront from March 25-31. The programme was organised by DBKU and Sarawak Multimedia Authority with the support of the state government. “I am happy that we were able to involve so many people and organisations in it. 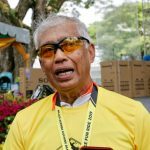 We also offered a wide range of interesting activities,” Abdul Wahab told New Sarawak Tribune after gracing a prize-giving cberemony for an event at the Kuching Waterfront today. “Thanks to the state government, we had this new concept of involving other organisations and the community in organising this project together,” he added. The mayor pointed out that with the theme “Empowering smart community”, the programme also incorporated the needs of digital economy. He continued: “Gradually, all jobs such as system analysts, clerk typists or office boys will no longer be specific careers because in general, everyone already know how to use emails which is considered a basic necessity in most jobs. “So these jobs should be remodeled and reengineered in line with Sarawak’s effort to move into digital economy,” he said. Abdul Wahab explained that DBKU aimed to enhance community services through OKSHe. “We wanted to inculcate mindfulness and a sense of responsibility within the community in order to overcome social issues such as cleanliness,” he said. “Compared to the past, the present communities show better attitudes in preserving the environment. When they have rubbish to throw, they put it in plastic bags and hold on to the bags until they find the nearest dustbins. “I hope this programme will kickstart local businesses and make Kuching a vibrant place,” added the mayor.